DAMASCUS: Syrian rebels withdrew in busloads from a town in eastern Ghouta on Thursday and handed it over to the army, the first such surrender since one of the fiercest campaigns of the seven-year war began more than a month ago. The Ahrar al-Sham group’s decision to accept the army’s terms and abandon the town of Harasta puts the government on course for its biggest victory over rebels since the battle of Aleppo in 2016. And in another part of the same region, the controlling rebel group, Failaq al-Rahman, said a ceasefire had been agreed, to start within hours at midnight local time, to allow a “final negotiating session” to take place. After dark fell on Thursday, around 30 buses carrying rebel fighters and their families left Harasta. Syrian state media said the buses carried 1,580 people, including 413 rebel fighters given safe passage to northwestern Syria. A military media unit run by Syrian President Bashar al-Assad’s ally Hezbollah said 1,500 fighters and 6,000 family members had agreed to leave. The army’s assault on eastern Ghouta, the last major rebel bastion near the capital, has been one of the most intense in Syria’s seven-year-old war, killing more than 1,500 people in a relentless bombardment with warplanes, rockets and shells. Before boarding the buses out of Harasta, a small group were shown on television in the fading light kneeling in a line for Islam’s sunset prayer – perhaps the last they would perform in their hometown. Children ran among the adults waiting to board. The eastern Ghouta campaign has seen Syria and its Russian allies use the tactics that proved successful in other parts of the country since Moscow joined the war in 2015: lay siege to an area, bombard it, launch a ground assault and finally offer safe passage out to rebels who agree to leave with their families. The government’s control of Harasta leaves eastern Ghouta’s rebels in control only of the town of Douma — under the control of Jaish al-Islam — and another pocket that includes the towns of Jobar, Ein Terma, Arbin and Zamalka — under the control of Failaq al-Rahman. State television reported that more than 6,000 people had fled Douma since Wednesday, crossing over into government-held territory. Failaq al-Rahman’s Istanbul-based spokesman Wael Alwan said it had contacted the United Nations to mediate a ceasefire with Russian forces “in order to negotiate with the Russian side about finding a solution to guarantee the safety of civilians and to guarantee that their suffering stops”. State media said rebels fired rockets from eastern Ghouta into Damascus on Thursday, killing two people. Television showed burning projectile parts on streets and in parks. On Sunday, Assad drove himself to a newly captured battlefront in eastern Ghouta, a demonstration of his seemingly unassailable position in a war that has been going his way since Russia sent its air force to help him in 2015. The deal to surrender Harasta began on Thursday with a prisoner swap. In an interview with state television, a Syrian soldier freed by rebels wept and thanked God and the army for his release. The Russian Defence Ministry website showed what it said was live footage from the Al-Wafideen crossing point from Douma into government areas. Over a period of several minutes, it showed dozens of people in small groups coming around a corner and trekking along the dirt road past armed soldiers. Some bore bundles of possessions, others carried small children or pushed prams. Douma is the most populous area in eastern Ghouta, and for more than a week it has been entirely surrounded by the government. 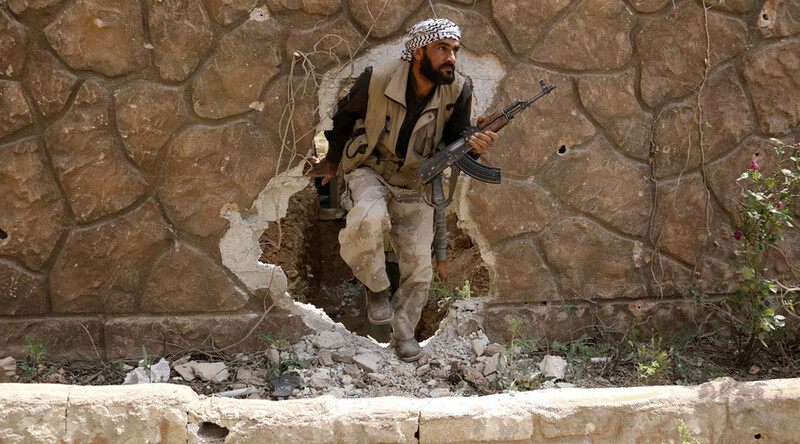 Jaish al-Islam has said it is determined to fight on. However, the Observatory said people leaving the area were doing so under an agreement between the group and Russia. However, the ferocity of the Syrian army’s offensive in eastern Ghouta has prompted Western condemnation and urgent pleas from United Nations humanitarian agencies for a ceasefire. Russia’s Defence Ministry said that, since Russia began imposing “humanitarian pauses” almost a month ago, some 95,000 people had left eastern Ghouta for government territory. The Harasta rebels will be taken to Idlib province in the northwest, which has become the main sanctuary for insurgents who agree to quit territory under deals with the government. The northwestern province is the biggest remaining area under rebel control in Syria and its population has been doubled by refugees fleeing other areas.